Top 10 Best Sewing Machine Reviews for 2019 | My Favorite Model! Finding the right sewing machine doesn't have to be a headache inducing experience. With a bit of information and know-how, you will be armed with the knowledge you need to make an informed choice that is right for your needs and budget. In this buying guide, we will break down the top brands and models available on the market, and provide some tips and considerations that may make choosing the right machine a lot easier. We will then briefly review 10 best selling, high-quality models that cover a range of prices and functionality. Singer 4423: top sewing machine based on consumer reviews, price and features. Brother cs6000i: easy to use model, perfect for beginners and newbies. Singer 4411: highly rated sewing machine & very durable based on price. Brother XR9500PRW Project Runway Edition: top rated for fun & fashionable projects. Singer 4432: highly respected brand with good rating & long warranty period. 1) What type of projects will you be sewing? 2) How many options should the best sewing machine for me have? 3) What is the weight of the sewing machine? 4) How fast can it sew (stitches per minute)? 5) Is the machine above or below my sewing skill level? 6) Is the brand or model easy to use? 7) Is my sewing machine loud? 8) How many built in stitches do I need? 9) How many sewing accessories are included? 10) How long is the sewing machines warranty? If you are brand new to sewing, you may not be aware of just how many types of machines are available. What follows is not a complete list of the various types of machines, but these are the most common choices for home and personal use. Chances are, when you think of a sewing machine, you picture the most common type - an electric model. One of the most popular and versatile, the electric machine is used by most people who work on sewing projects today. Sewing machines usually utilize a single motor to power the needle and feed dogs of the machine. Often, the speed of the needle is determined by the pressure that the user places on the foot pedal. The harder you press down on the foot pedal, the faster the machine sews. The pieces of fabric to be sewn feed through with a presser foot that holds them tight while the needle goes up and down. Fabric is guided through the presser foot with both hands. Most automatic machines will have dials or display panels that allow you to choose basic sewing parameters. Stitch type and length are the most common things that sewers want to adjust. Most machines generally come with a good selection of specialty stitches in addition to the typical forward, reverse and zig-zag. Some machines even offer more advanced options like enhanced thread tension settings, automatic thread cutting, or automatic buttonhole stitching. Electric sewing machines are good all-purpose models that can be used for a variety of different types of fabrics and projects. Most machines today offer a broad range of stitch types that meet most home sewer’s needs. Quilting requires a different set of features. Traditionally, a long arm machine was the way to sew a quilt. The problem is that long arm machines are expensive, large, and a bit unwieldy. This led to the development of a more standard size that was designed specifically for making quilts. They are heavy duty that can handle thick and multiple layers of fabric that quilters work with. Even the most basic models can sew together the 4-6" blocks that are found in many pieced quilts. These blocks are then layered, basted and sewn together. In some models, attachable walking feet are included that help to move the fabric smoothly through the presser foot and needle which reduces fabric shifting and bunching. When fabric doesn’t move easily, this can negatively affect the final result and may even cause the needle to snap off due to pressure from the bulk of the quilt. 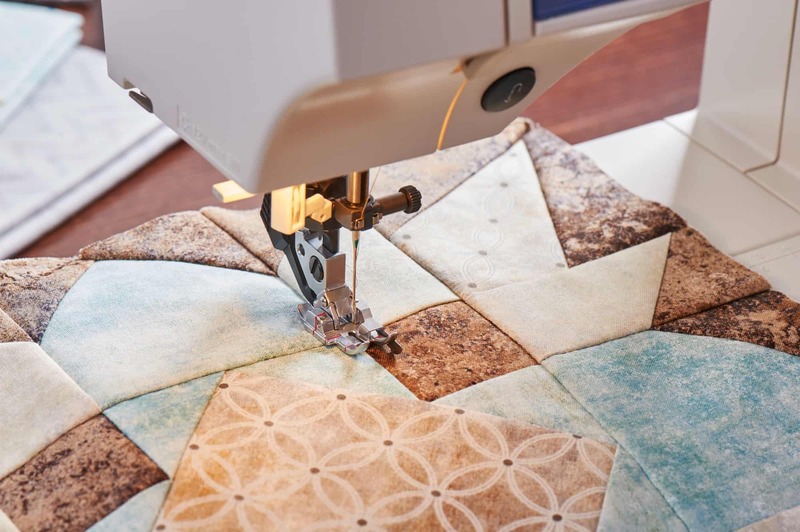 We put together a full buying guide to help you find the perfect quilting sewing machine here if you are in the market. Like a regular sewing machine, a free arm machine is comprised of a shuttle feed, free dog, and bobbin. With this type of machine, the sewing surface is rounded and open at the bottom. This allows for a pant cuff or shirt collar to be slipped over the end of the machine while the seam to be sewn is passing under the presser foot. Pant and shirt cuffs alterations and small craft projects are examples of just some of the things that sewers find a free arm machine indispensable for. A free arm machine is typically portable, meaning it does not come installed on a stand or table. You mount it to the surface of your choosing. Many quality computerized machines come with a free arm as well. Computerized sewing machines are more advanced and come lots of functions and a variety of user options. These are typically not recommended for beginners, as they have many options and selection settings that can be overwhelming for someone just starting out. A computerized model, as the name implies, uses a computer for a wider range of settings and options. These machines often have a large LCD or touchscreen for their interface. From here, you select your preferences and design parameters. A lot of computerized machines have memory which allows you to store the settings for several different projects at once. Computerized machines have a lot of automatic functions and some can even do embroidery or other specialized stitches. Most of them have USB ports which allow the users to download new patterns and add them to their machines. Computerized machines come with an extensive stitch library and are suitable for use on a broad range of materials. They are very versatile and can handle a lot of different types of projects. While we have mostly discussed and described more general or all-purpose sewing machines, some are designed for a very specific function. These machines are not intended for general sewing and often come with a hefty price tag. An embroidery machine is one that is designed especially for making the complex and specialized stitches that comprise embroidery. These machines are designed for the sole purpose of embroidery, so they include a specialized stitch library that contains all the main stitch types used in most projects. They often have a lot of auto features, such as tension, which makes it easy to keep your thread appropriately taunt. Most embroidery machines have a USB interface to allow for personalized design creation. Many have a design software suite that comes with all the tools you need to create your own unique designs. Many of these machines have an LCD or touchscreen interface which makes option and setting selection as simple as using a smartphone. You can see my embroidery sewing machine top picks on this page. Of course, one of the biggest questions and factors of choosing the right sewing machine is the cost. Looking for a general price range can be difficult and the answer to the question of "How much, on average, should it cost?” is often, it depends. That's a frustrating, but honest answer. Sewing machine is a generic term that encompasses many different types of machines. These machines offer different types of interfaces, versatility, and functionality - as discussed above. This means that, just as the types and features vary widely, so too does the price. There are affordable, but scaled down models that you can pick up for less than $100, and at the same time, there are sophisticated, advanced machines for expert sewers that can cost thousands of dollars. Features and functionality will be the biggest determining factors as to the ultimate price of the machine. A good rule of thumb is the more you want to do with the machine and the more control you want to have, the more the machine will cost. A beginner or kids machine certainly does not need to have as many options that it becomes confusing. On the other hand, an expert sewer is going to need something better than a budget conscious buyer. Keep your intended use in mind as this will help you narrow down your price range. If you want a digital or touchscreen interface, or personalized design options, expect to pay more. These options give you more control and make it easier to create unique designs. Another factor is type of fabric you plan to sew most. Complexity and versatility will add to the cost of the machine, but it also adds to the value as well. Now that you know about the different types of machines and the factors that determine price, there is still a bit more to do before you can make your final decision. Below are some questions to ask yourself to help you select the best machine. This might seem like a common-sense question, but it is incredibly important. Not all machines work for all types of projects. This means that you need to consider what types of projects you will be doing. Do you want to make clothes, and blankets, as well as having the ability to repair fabrics? If so, then a more traditional automatic or computerized machine is likely to suit your needs just fine. Is your intention to do fine embroidery or make quilts for friends and family? If so, then a regular one is not likely to have the functionality or the ability to handle robust projects. For more specialized projects, it is important that you buy a specific type, such as an embroidery or a quilting machine. These are designed to have the stitch variety and heavy duty abilities needed when working on this type of design. Some sewing machines are quite basic, whereas others are downright complicated. Chances are, what you need probably falls in the middle, but it is something that you should keep in mind when looking at a particular model. Some have limited functionality. They are designed for light use, typically for beginners, and do not have all the bells and whistles of more advanced counterparts. These are perfect for a newbie or child as they are not likely to require an in-depth understanding of all the different functions and design parameters. The lack of options is not likely to suit advanced users, so keep that in mind if you are an experienced seamstress. More advanced machines that have a wider range of settings will be more attractive to these users. Advanced users understand the terminology, and the nuances behind the different types of stitches and design parameters. A beginner would probably just be confused by all the choices and get frustrated. The ideal number of features and options depends on the user and is something to take into consideration as it will definitely effect the price. If you plan on moving your machine often, you will want to get something that isn't too heavy and is portable. Even modern machines vary widely in size and weight. Measure your table or space where you plan to sew and make sure your machine will fit. You will want to have some extra room as well to store your scissors and other tools. Most manufactures will provide the dimensions and weight by model. Sewing machines can be run at a variety of different speeds, allowing you to make quick work of a project or to slow down for accuracy. Many machines have a foot pedal, which allows you to use pressure to help determine the speed of the stitching. However, there are some computerized and specialty machines that allow you to set your own, sometimes extremely fast, speeds. If you want a range of functionality when it comes to speed of the stitch, keep this option in mind. Some machines are better suited for fast speed sewing than others. There are even machines that are expressly designed for high-speed stitching. Industrial models are usually the fastest, but they also generally have a fairly steep learning curve and are not recommended for beginners. There are consumer models that are designed for high-speed sewing as well, but none that can match the speed of an industrial machine. Sewing machines are not one size fits all. Different machines are better suited for those at different skill levels. Some machines have more features and settings that are designed for sewers with advanced skills and understanding. On the other hand, some machines are designed for beginners, meaning that a lot of the basics will be preset and there won't be a lot of options to limit confusion. Automatic's tend to be the best general or all-purpose option for beginners. They have generally have a large range of functionality, but they do not have all the bells, whistles, and settings that a computerized machine has. Computerized models provide enhanced control and personalization, allowing more advanced users to create more complex designs. You should expect a bit of a learning curve with any new machine you purchase. However, some are more user-friendly than others. Some have an easy to use interface that guides you through selecting the proper parameters and options. Other machines are designed for those who are a bit more tech savvy. These machines have a less user-friendly interface and more complex menu system for advanced users. You can usually tell how easy the model is to use by reading the sewing machine reviews. This gives you a good idea as to the actual experience of people who have bought the machine. Not all sewing machines are quiet and, as a rule, the more heavy duty it is, the louder it is likely to be. This is not always the case as there are powerful machines that are specifically designed for quiet operation. These machines are generally pretty expensive. Noise is a concern for a variety of reasons. Maybe you need to keep your machine in an area where your family members sleep and you don't want to keep people awake at night. You also should consider your own hearing as well, since we know that extended exposure to really loud noises can permanently damage our hearing. Modern machines are not nearly as loud as antique machines. There has been a lot of improvement in motor technology that allows for a smoother and thus quieter operation. If you live in an apartment or somewhere that noise in an issue, be sure to look at the sound specifications to ensure that you won't be bothering your neighbors. Built in stitches refers to the pre-programmed library of stitch parameters that are included. Some machines come with just a few basic stitches, whereas others have hundreds or more. An important decision when narrowing down the models you are considering is to decide how many built in stitches you want or need. A beginner might not need hundreds of different choices, but an advanced user will most likely want a larger selection. One thing to keep in mind is that the built in stitches included with your machine is a set number. Additional stitches cannot be added to or programmed into many sewing machines unless you have a very expensive, top of the line model. In the end, what you plan to use the machine for will determine the number of built-in stitches you will want. If you have a very specific purpose, fewer are needed. If you want to use your machine for a broad range of projects, more stitches make this possible. The actual sewing machine does not often include everything you might want or need to get started. This is why it is important to look at the accessories that are included and which will have to be purchased separately. Some machines come with pedals or foot switches and a variety of attachments. Some companies only supply the machine, and accessories will have to be purchased separately. This can add a lot to the final price tag to get started, so make sure you check to see what is included. Sewing machines are expensive. You want to make sure you are covered if something breaks or goes wrong. It is important to check the warranty that comes with the machines you are considering. In addition to finding out how long the warranty is, you will also want to understand what is coveted. The best sewing machines have a long warranty and lifetime customer support. There are very basic, often short term warranties that mostly cover manufacturer defects. There are also more comprehensive warranties (sometimes these can be bought as an add-on at time of purchase) which will even cover user error. When you spend hundreds (or thousands) of dollars on a sewing machine, you want to make sure that your investment is protected. 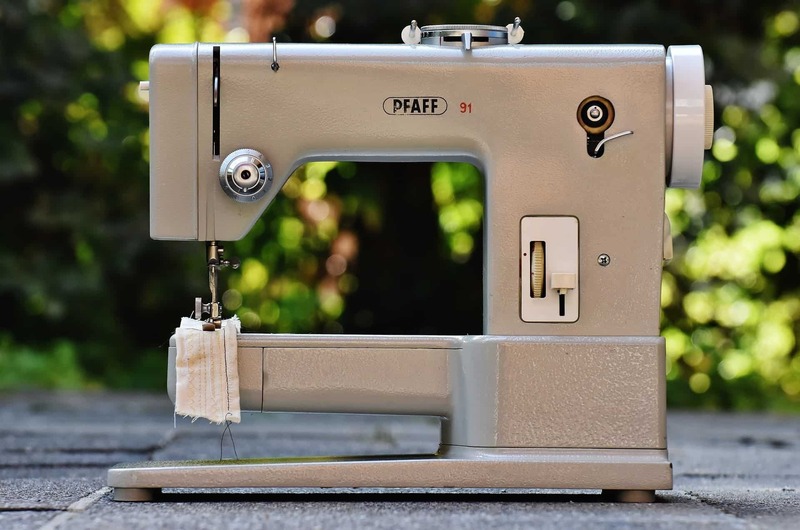 Most sewing machines come with at least a 1 year limited warranty and some come with a lifetime warranty, so add that to your list of items to compare. Why You Should Buy It: The Singer 4423 is an excellent all purpose, heavy duty machine ideally suited for an array of projects. Singer is a trusted and well-known brand that has been around forever and highly recommended. Their 4423 is an excellent general purpose, robust sewing machine that can handle a ton of different projects. The machine is well built and machined from stainless steel. It is powered by a robust and powerful motor. It has a variety of features that give it versatility and durability. The 4423 features 23 different stitches, ranging from basic to specialized like the buttonhole. The needle is automatically threaded, eliminating frustration of threading. The drop-in bobbin makes it easy change the thread when needed. The motor is powerful, boasting that it is as much as 60% stronger than comparable models. It is a high-speed machine that can sew 1,100 stitches per minute. This is perfect for those who want the ability to do fast projects. Many machines have problems in construction that lead to fabric bunching. The 4423 has a stainless steel bed plate, which allows the fabric to slide easily across the arm, reducing the likelihood of bunching. The 4423 has an easily changeable foot pedal so that you can use the pedal that comes with the machine or you use your own. The pedal is pressure adjustable, meaning that you use foot pressure on the pedal to speed up or slow down the speed. The 4423 features on board storage which allows you to conveniently store accessories and other bits and bobs with the machine. 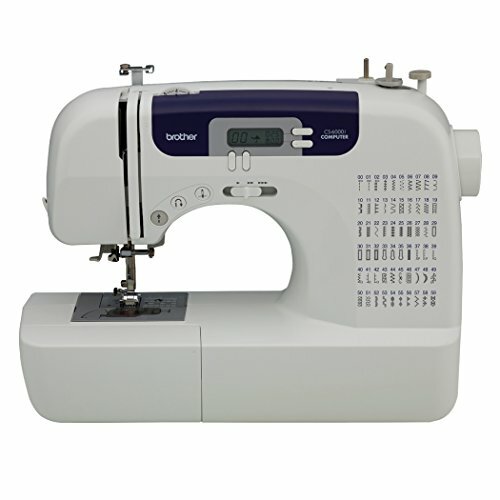 Many people consider the 4423 to be the best sewing machine on the market for all users. Why You Should Buy It: A versatile computerized sewing machine that comes with a wide base table for enhanced functionality. 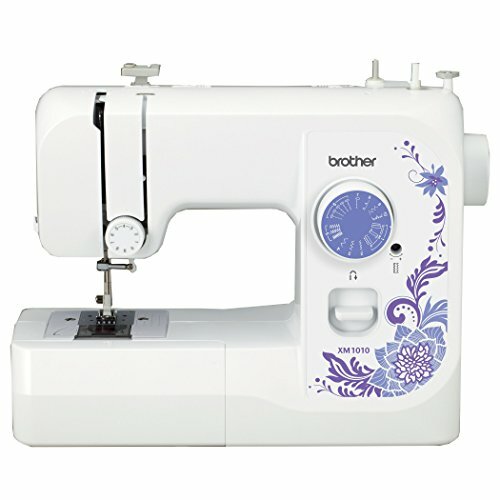 Brother International is a reputable and time-honored company that is known worldwide for making high-quality home products from printers to sewing machines. The cs6000i is a computerized model with a broad range of features and functionality. This machine has 60 stitches, including many specialty and advanced ones. It has an automatic needle threader and bobbin winding system for easy setup and thread replacement. The cs6000i has electronic variable speed control, giving you precise control over the sewing speed of the machine. It can be operated at a relatively high speed - as much as 850 stitches per minute. It is easy to use and has a LCD display and a LED lit work area. The table is oversized, making it perfectly suited for small and large projects. Why You Should Buy It: An affordable, durable, heavy duty sewing machine that offers a range of features and functionality. 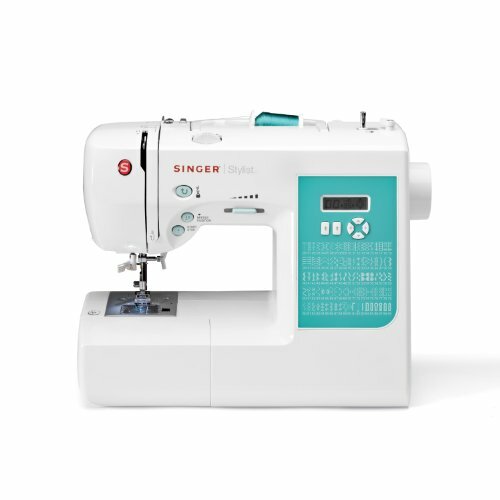 The 4411 is another high-quality sewing machine from the Singer brand. This is an automatic model that is powerful, well designed, durably built, and perfect for the beginning to intermediate sewer. The machine is made from a tough metal frame and has a stainless steel bedplate and a motor that is up to 60% more powerful than comparable products. Convenience features such as a top drop in bobbin, drop feed, and auto tensioner makes sewing a lot simpler compared to competing models. The 4411 features 11 built-in stitches, including a few specialty like buttonhole. It is also incredibly fast and can sew up to 1,100 stitches per minute. The snap-on presser feet are extremely easy to change and install, and the machine features adjustable pressure foot pedals. The free arm helps to make sewing collars, cuffs, and other curved pieces simple. The machine can be used in 3 needle positions and offers more clearance at the foot pressure to account for bulky or thick fabric. It also has on board storage for added convenience. Why You Should Buy It: Limited Edition computerized sewing machine with a vast library of stitches and added features. Another high-quality offering from Brother International, the XR9500PRW is a special edition that has a ton of features and enhanced functionality, as well as a durable, reliable build and design. This is a highly versatile machine that features 100 different stitches, including a variety of specialized buttonhole choices. This machine is suitable for a range of projects from clothing to home decor. It has 140 different stitch formations and a free arm for easy sewing of collars, cuffs, and other curved pieces. It features an adjustable needle position button and a LED work area light to help see the finer details. It has several added convenience features, such as an automatic needle threader, drop-in top bobbin that is resistant to jams, as well as on-board storage and a hard cover. Why You Should Buy It: A heavy duty automatic machine that offers increased functionality and is perfect for intermediate users. The 4432 is quality product from Singer. This is a great intermediate level sewing machine as it provides an excellent blend of enhanced features and ease of use. The 4432 has 32 built in stitches, giving you a variety of choices for tons of different projects. The included stitches even contain specialty ones like buttonhole. The machine features and automatic reverse and allows for easy adjustment of stitch length and width. It features a free arm for easy sewing of curved surfaces and an extra high presser foot lifter to give you more clearance for bulky material. It features adjustable foot pressure speed control as well as on-board storage. Why You Should Buy It: A good all-purpose machine for intermediate to advanced skill levels with lots of options. The machine has many different options and convenience features that allow you to easily customize your projects and keep everything organized. The machine boasts 130 included designs, including multiple styles of buttonholes. The machine can also monogram and has 170 different stitch functions. It also comes with a flip chart that makes it easy to see all the different stitches built into this model. The HR1850 features a detachable wide table, allowing you to convert the machine for larger projects easily. It has a LED display and several added convenience features such as automatic threading, drop-in bobbins, and an enhanced feed system. The HC1850 can be used with or without a foot pedal, giving you, even more, options for how you wish to operate the machine. It comes with an instruction manual and DVD and features a 25-year limited warranty. Why You Should Buy It: A high-end sewing machine with enhanced functionality for the advanced user. For the advanced sewer who wants a powerful machine that is suitable for a wide range of projects, the 9960 is an excellent choice. This is a high end computerized sewing machine that has in-depth customization that allows advanced users to create complicated pieces. The Quantum Stylist features an incredible 600 built in stitches and advanced capabilities enabling it to be used even for quilting. The heavy duty design gives it the strength and power it needs to handle even the most complex of projects. There are a ton of different convenience features like an automatic needle threader, automatic stitch length and width adjustment, needle up/down button, and more. It comes with a buttonhole plate for a variety of specialized stitches. It also includes an extension table to allow you to work on larger projects easily. It features a large, bright LCD display screen and comes preprogrammed with 5 different alphabet styles for easy monogramming. The machine has 25 different needle settings, and can be set up for twin needles. It is a high-speed machine that has fast, error free threading. It comes with a full range of accessories included, meaning you don't have to buy a bunch of additional items before you can use it. Why You Should Buy It: Good, robust sewing machine that is affordable and designed with beginners in mind. 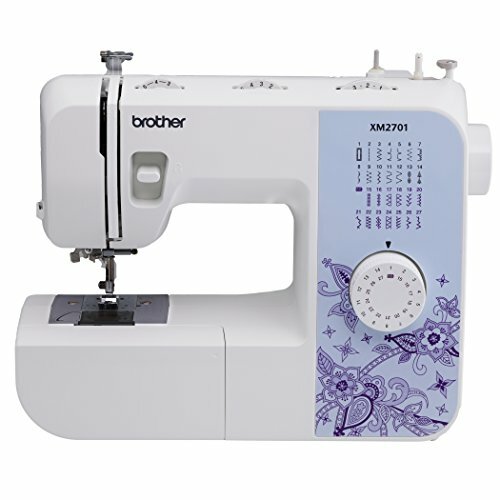 Brother International is known for making high-end, advanced sewing machines, but they also make several models that are ideally suited for beginners. The XM2701 is an affordable, easy to use, automatic model that is tailored for the beginner to intermediate. It has a vast range of features that makes it easy to work on a variety of projects and customized pieces. The machine features 27 stitches and includes specialty stitches like buttonholes. It boasts 63 stitch functions, making it suitable for projects ranging from clothes to home decor. It has a simple needle threading system and a jam resistant top drop in bobbin to make getting your machine threaded and ready to go quickly. It features a LED light to help illuminate your work with less eye strain. Why You Should Buy It: A high-end model with tons of features and customization options for the advanced user. 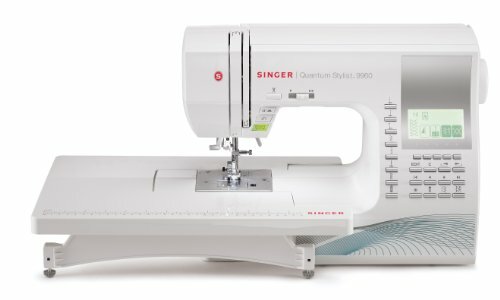 The Singer 7258 Quantum Stylist is an award winning, high end computerized sewing machine with enhanced functionality and built with the more advanced user in mind. It has a number of convenience features and allows for easy customization. The machine features 100 built-in stitches, giving you an excellent range of different types of stitches. It includes basic stitches, those for quilting, and even heirloom stitches. You can quickly select your desired stitch using the simple push button selector. The 7258 features auto tension and other settings that make adjustments painless. It also features an automatic presser foot and a bobbin winding clutch needle bar that makes winding safer. The 7258 has speeds that max out at 750 stitches per minute. Is has on-board storage, and all needed accessories are included. Why You Should Buy It: An affordable, easy to use beginner’s sewing machine with enough functionality to be suitable for a range of different projects. As a beginner’s or an affordable model for everyday use, the XM1010 is an excellent choice. It is lightweight, portable and includes a variety of features for versatility. The machine includes 10 built-in stitches, including buttonholes. It comes with four different sewing feet and a free arm, which allows for easy sewing of collars, sleeves, cuffs, and more. It is easy to thread and has jam resistant bobbin system to reduce issues with threading and sewing. The XM1010 is an automatic machine that allows you to control tension easily and to reverse stitching with the use of a dial. The machine is sturdy, portable, and comes with an instructional DVD to provide in-depth use instructions. Sewing is a relaxing and rewarding hobby that can be functional and practical, or purely for fun. Finding the top sewing machine depends on several objectives, ranging from skill level and style of projects you plan to work on, to versatility and more. In this buying guide, we have given you a basic overview of the main style of machines available as well as considerations you’ll want to think about before making a purchase. Finally, we provided brief reviews of 10 to machines (sorted by brand and model) that cover a range of uses and skill levels. We feel that these give you a good idea of the features of machines and the users they best suit. Whether you choose one of the models that we reviewed here, or you simply use this as a starting point for finding the perfect machine, you are now armed with the information you need to make an educated decision. 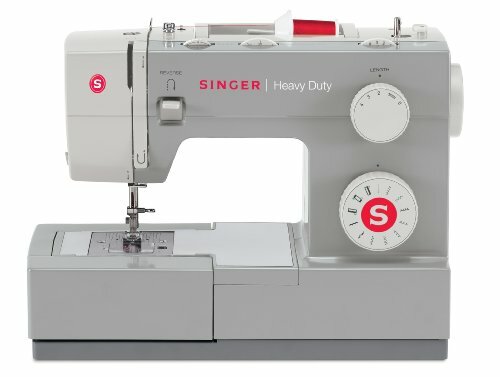 I love the Singer 4411 Heavy Duty but I don’t like the fact that it’s not suitable for leather or other super heavy fabrics and comes with only 11 built-in stitches. Though the motor is really powerful and the speed is high, so still nice to work with. The Singer 4432 actually has limited customization but has convenience features which I love. I’ve used it for a long time and would give it five stars. I finished fashion school last year and I felt like I learned a lot about sewing…so The Project Runway machine was very easy for me to use. I love that it is computerized and has a hundred built-in stitches plus it can also be used for monogramming. Totally awesome. 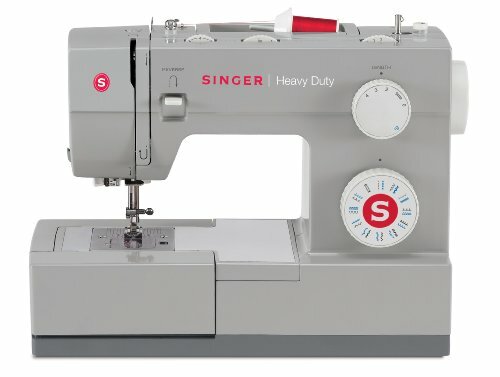 The well built stainless steel Singer 4423 Heavy Duty Sewing Machine is like my favorite sewing machine which I have used since I can remember and have never had any problems with it. Though it comes with only 23 built-in stitches, there are many auto options available to make it easier for you to use. It may not be suitable for leather or other really tough materials but it’s great for different projects. I sew for fun and for personal use. so when I saw the Brother XM1010, I knew it was made for me. It’s affordable and I love that it is lightweight which makes it easy to move it about the house. Plus it doesn’t make much noise. The cs6000i machine has been my trusted sewing machine for years now. It has electronic variable speed control and 60 built-in stitches which I really appreciate. The Project Runway Edition Sewing Machine a great computerized sewing machine with a vast library of built-in stitches and added features. It’s my number one go to sewing machine for monogramming and does a lot of other things as well…check it out. 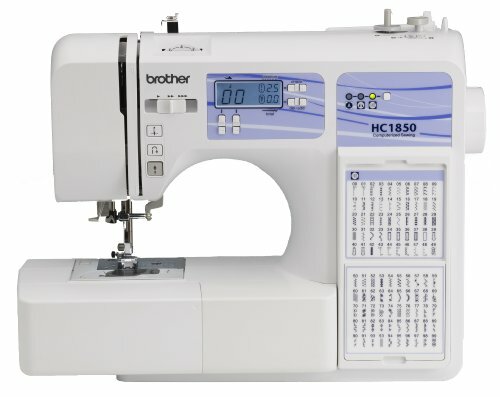 130 built-in stitches, a wide table for the ability to sew larger items and 25 years warranty was all I needed when I went to buy the Brother HC1850. I have been using it ever since for personal use and love it! 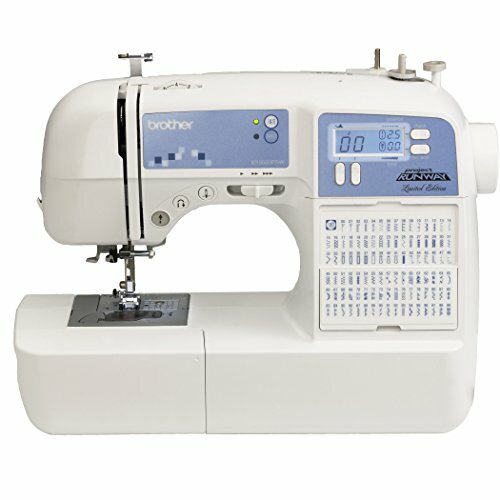 The Brother cs6000i has been my trusted sewing machine for years now. It was a little confusing to use at first but once you get a hang of it, you are good. It has electronic variable speed control and 60 built-in stitches which makes your work way easier. For finishing interior edges and for attaching decorative edging and strapping, I use my trusted Brother 2340CV Cover Stitch. It sews perfect necklines, armholes, or hems without ironing and is very great for t-shirt hemming. Some things I like about the Singer 4411 Heavy Duty is that it is affordable, durable, and offers a nice range of features and functionality. I love working on it.